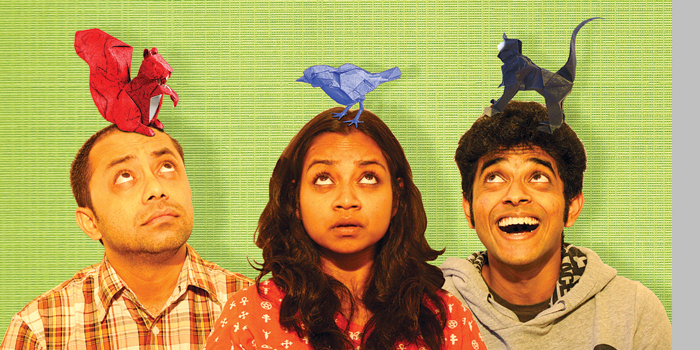 Jugaad Co presents Animals Out of Paper, a play that revolves around the life of an expert origamist. Written by Rajiv Joseph, the play has been performed at Broadway and now makes its way to Bangalore. We chat with director Jimmy Xavier ahead of the show. Animals Out of Paper is about a world renowned origamist who learns how life cannot be arranged as neatly as in an origami model. There are four characters in the play. Ilana, played by Rebecca Spurgeon, is the protagonist who has just had some devastating life changing moments. She hides away in her origami studio, cut off from the rest of the world. Andy, played by Anshul Pathak, is a maths teacher dabbling in origami, who rudely interrupts Ilana in her studio, which makes for some delightfully awkward and amusing moments. Origami student, Suresh is played by Naveen Richard. He is also a hip-hop addict. Origami is what brings these three characters together and it in fact, lies at the soul of the play. As part of the design, we plan to move from scene to scene without the play ever stopping. Thata��s where light and intelligent design play a huge role. Niranjan from Attakalari is designing the lights. Ia��ve also introduced an element of music that is not originally part of the script. Since the cast have other commitments as theya��re full time actors, it is hard to slot time sometimes. The good thing however, is they are extremely talented so I only have to tell them what I want once and they deliver.